Microsoft announced yesterday that it has rebuilt its cloud file storage service, SkyDrive. It’s touted as being faster with HTML5, has improved layouts for different file and photos, and using Internet Explorer 9 and Windows 7, you can pin SkyDrive to your Desktop for quick, easy access. The jump list can also allow you to get to tasks that are buried a little bit with a single-click. SkyDrive allows you upload, view, and create Office documents (Word, Excel, Powerpoint, and OneNote). You can also upload photos into an album and share them with others easily. You can check out the What’s New page for more details of the latest features. Although I’m only seeing 5GB of storage in my account, a tweet from Microsoft News promises 25 GB of storage free (perhaps for new sign-ups only). You can store files up to 100MB in size. Folders can also be synced to SkyDrive with Windows Live Mesh from the Windows Essential package. SkyDrive also puts an emphasis on profiles and social aspects of the web, allowing you to easily shared files and photos across social networks and make your files public, limited, or private. Greater integration between SkyDrive and Windows Phone 7 will be coming later when the next update for WP7 is released. Re-engineered with HTML5, the service is fast and very functional. This might be quite a blow to Silverlight as some are speculating. The refreshed experience has broad application, as SkyDrive has emerged as a single service for access and sharing across Windows, Office and smartphones including Windows Phone, iPhone and Android. To date, SkyDrive has helped more than 100 million users store and share their files on the Web. Today’s relaunch aims to make the experience more enjoyable and efficient in the following ways. Faster: The time it takes to perform common tasks such as clicking on folders and navigating photo albums will drop from 6-9 seconds down to 100-300 milliseconds. The new SkyDrive takes advantage of hardware accelerated graphics and advancements including HTML5 video tag to support playback of H.264 videos (with support for files of up to 100 MB). And with IE9 on Windows 7, customers can pin SkyDrive to their taskbar for even faster access to the files they want. Easier to Navigate: The new SkyDrive brings together all photos, docs, and files into one view. Navigational elements and layout are now consistent with Windows, so customers will find the site familiar and easy to use. Photos Take Center Stage: The new SkyDrive removes previous design elements so photos now fill the browser. Also, photos are presented in their original aspect ratio, and with the new best-fit grid, pictures are laid out so users can see them all, including panoramas. Primary strengths of SkyDrive include the sharing of Office documents in the cloud, access and sharing of photos across devices, particularly with Windows Phone, and the fact the service is free. Microsoft announced deeper integration between SkyDrive and Windows Phone on June 7. With the release of Windows Phone “Mango” later this year, users will be able to share photos stored on SkyDrive via email, text, or IM. They will also be able to share videos immediately after shooting them, with the upload happening in the background. Windows Phone brings instant access to docs in the Office hub so users can view folders and files directly on their phone. In addition, SkyDrive will continue to offer a mobile Web app at SkyDrive.com that works with iPhone, Android and other modern smartphones for viewing and accessing Office docs and other files. Also, the OneNote app for the iPhone brings access to notes stored on SkyDrive from anywhere. 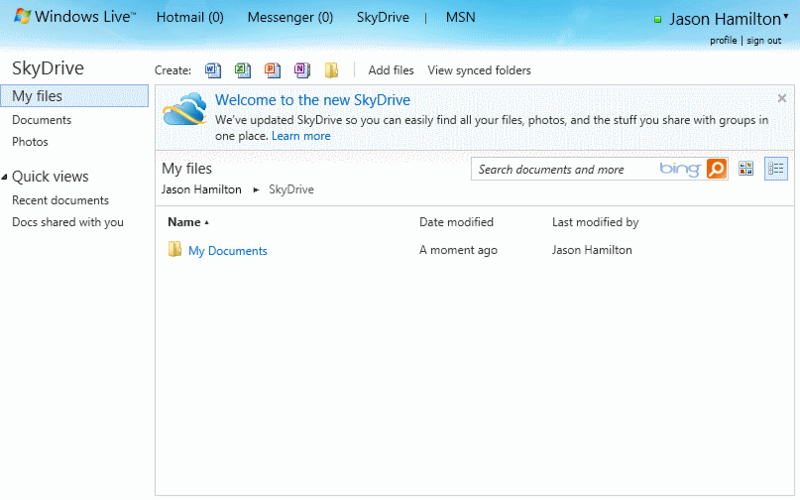 Find out more about the relaunch of Windows Live SkyDrive on the Inside Windows Live blog. Get Windows Live SkyDrive today: Free signup.